This past week was another busy one. 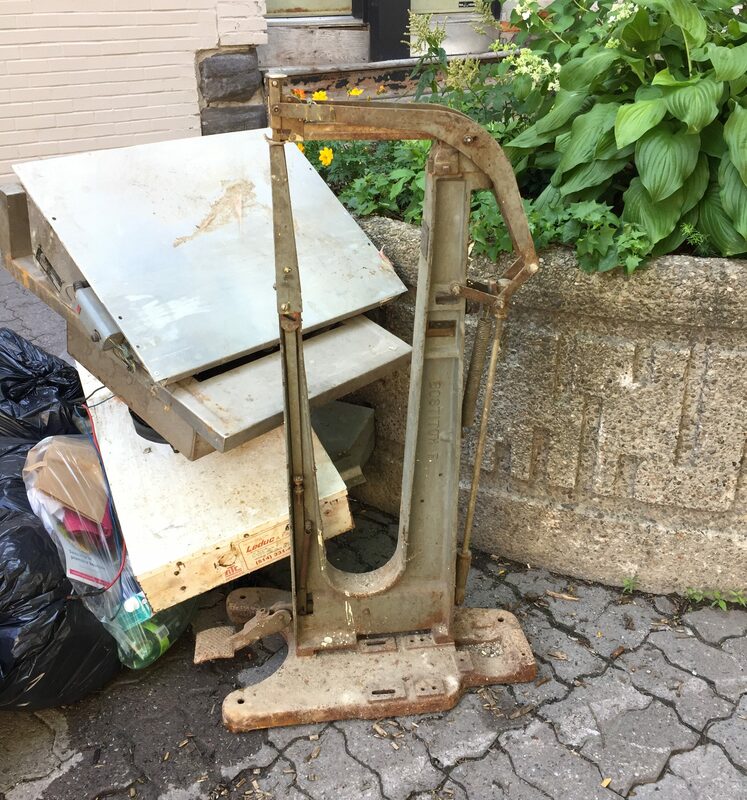 I filled the car with quality garbage on three different runs, and came away with other great stuff (including what might be my best find of the year) on a couple others. 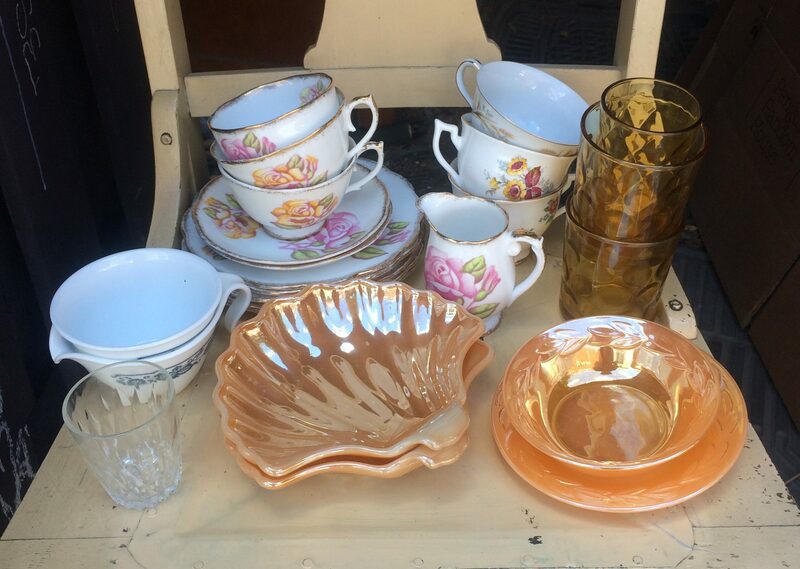 All this extra junk made it hard to get around my garage; fortunately the auction house reopened after a two week vacation and I was able to bring four carloads of stuff there! I definitely went over their not strictly enforced limit of 20 items a week, but I got away with it by being charming and well prepared (plus, because I have a small car I never bring too much at one time). I’m nowhere near close to cataloguing last week’s finds so here’s some random stuff from the last month or so. 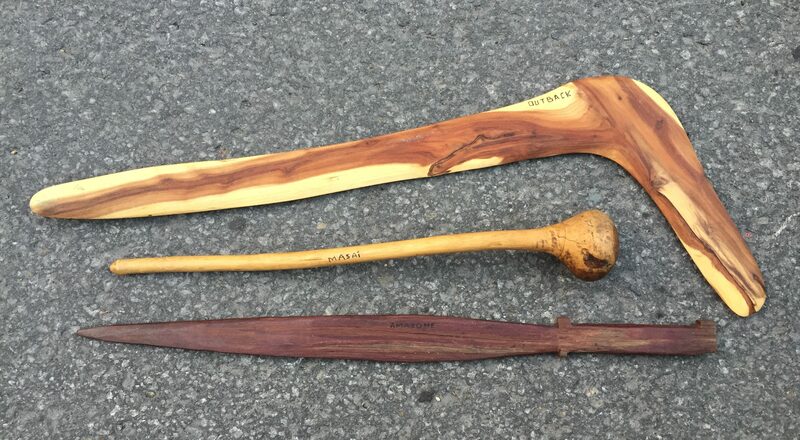 Some folks in NDG tossed a few interesting things, including this collection of tribal weapons. The previously owner wrote the origins of the pieces in pen: “Outback” is written on the top piece (which looks like a non-returning boomerang – I assumed all boomerangs returned before I did my research! ); the club in the middle says “Masai” (an ethnic group in Kenya and Tanzania); and the sword on the bottom reads “Amazone.” All these pieces are wood and seem to be higher quality than your average tourist junk. I brought them to the auction house and we’ll see how they do. 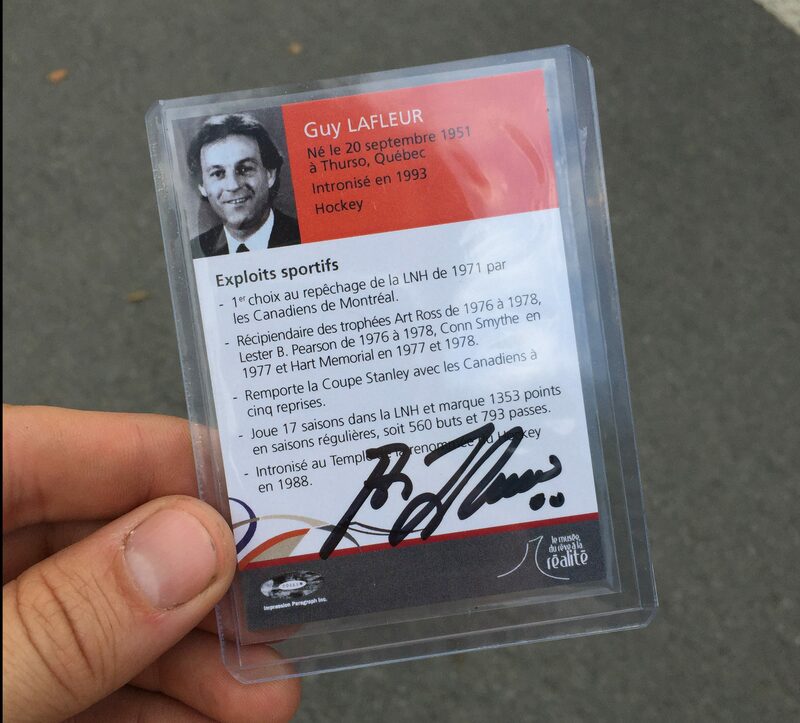 I also found this signed Guy Lafleur sports card. It’s hard to know why someone would throw this out, but I guess whoever owned (or inherited) it didn’t appreciate it fully. 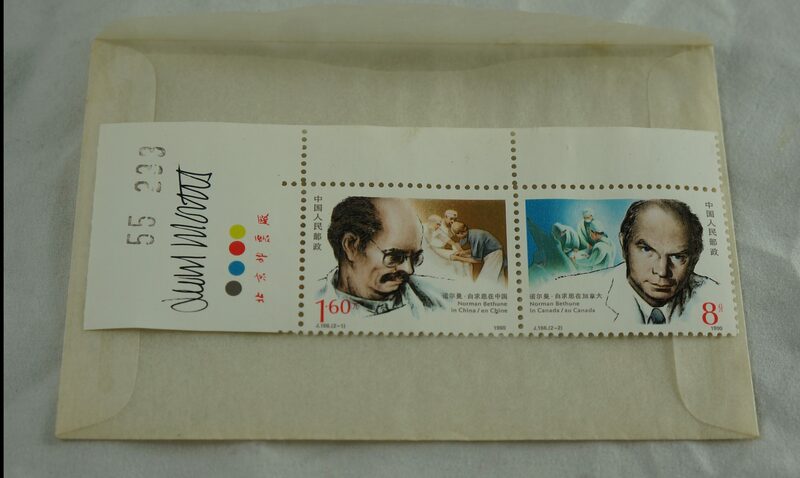 I also found these Norman Bethune postage stamps inside a little envelope. Apparently Canada and China worked together to design these and they were issued in both countries. They’re signed by someone (on the left) though the scrawl doesn’t seem to match any name associated with the project. This spot is still producing, though I haven’t found anything particularly interesting there since that first day. 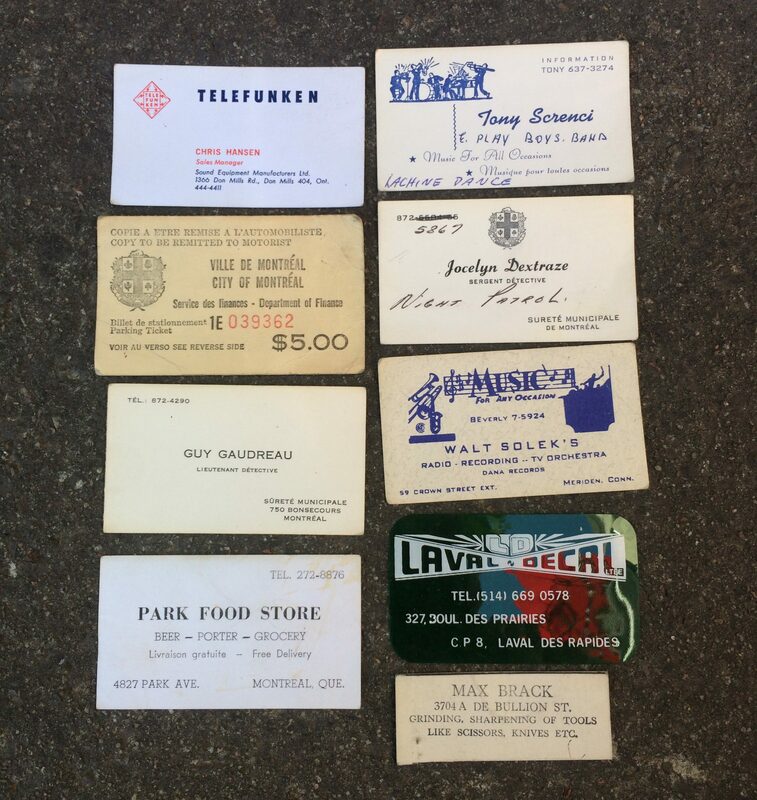 A spot in Outremont has produced some great finds, including some paper ephemera that I was able to quickly sell for good money. Here’s a collection of business cards I found one garbage day. Here’s a selection of some of my favourites. I love old business cards! Tucked among those cards was a 1959-1960 Toronto Maple Leafs season schedule. 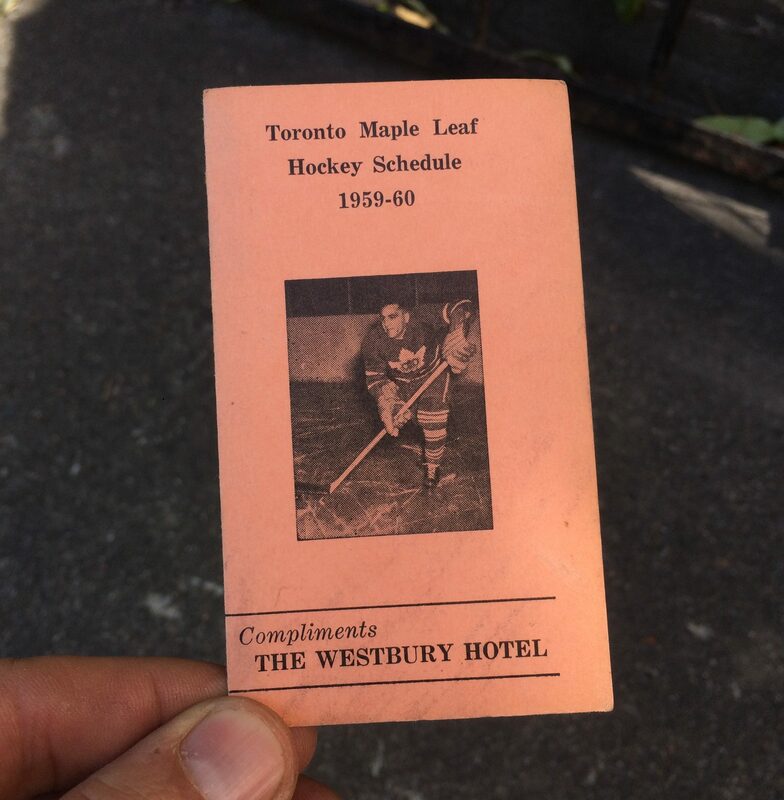 It was printed for the Westbury Hotel, a luxury establishment that operated not far from Maple Leaf Gardens in downtown Toronto. 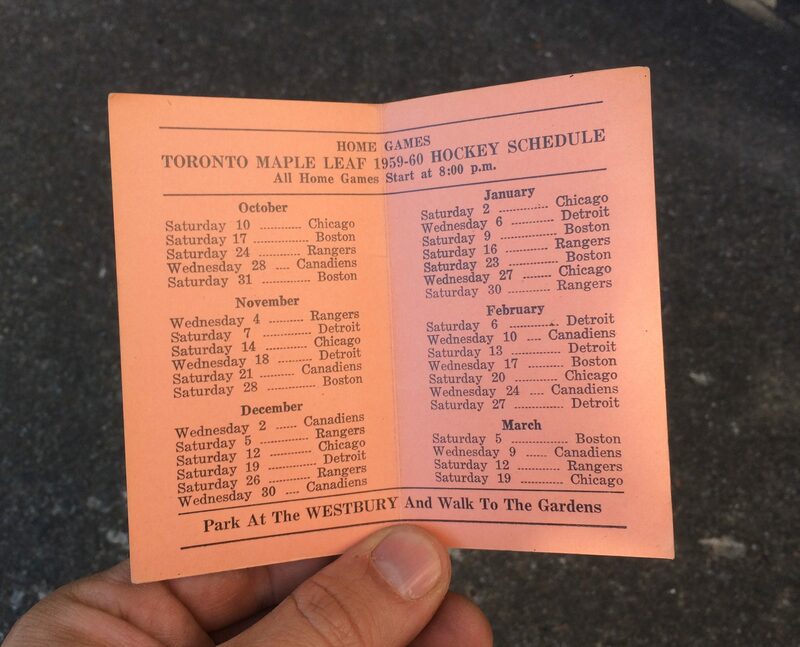 I tried to find another like it online but had no luck, much like the 1944-1945 Montreal Canadiens schedule I found last year. I seem to have a knack for finding uncommon pocket schedules! Pricing things without any specific precedent can be tough, but looking on eBay you can find that old NHL schedules can sell for a pretty penny. I sold that Canadiens schedule for 150$, but this one was a more recent so I priced it a little lower. It sold very quickly for 100$, and I already got positive feedback. Maybe I could have gotten more for it, but I’m pretty happy to get 100$ for a little piece of paper! 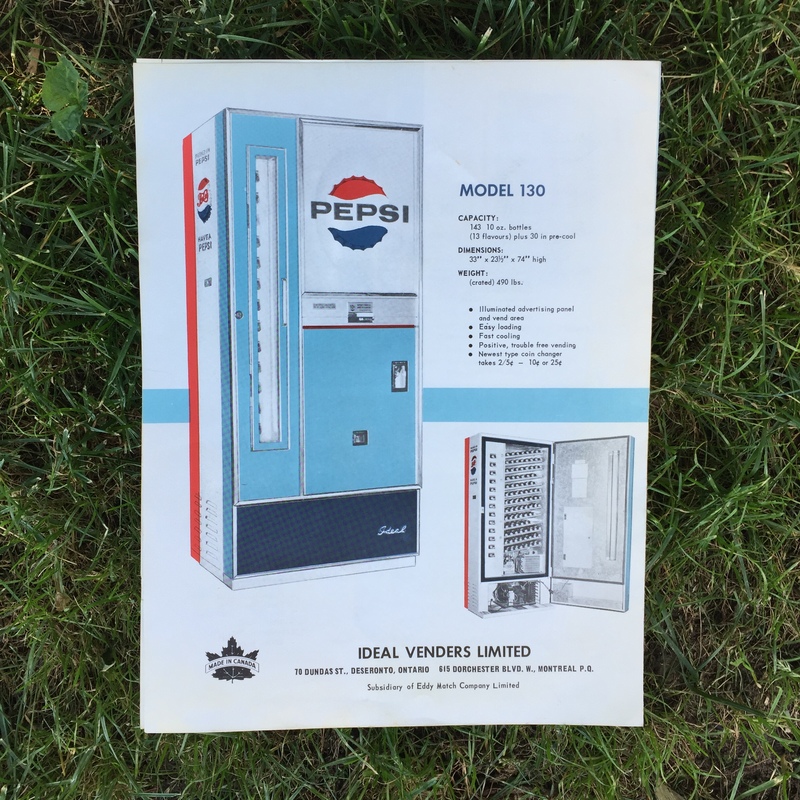 Another quick seller was this vintage (I’m guessing late 50s or early 60s) Pepsi vending machine catalogue. I also couldn’t find any others like it online – it sold quickly on eBay for 75$. From what I can tell the previous owner ran a furniture store back in the day, and it looks like he went for the Model 6 in the gallery below. Soft drink collectors are a passionate bunch so it’s always a good idea to aim high when pricing! 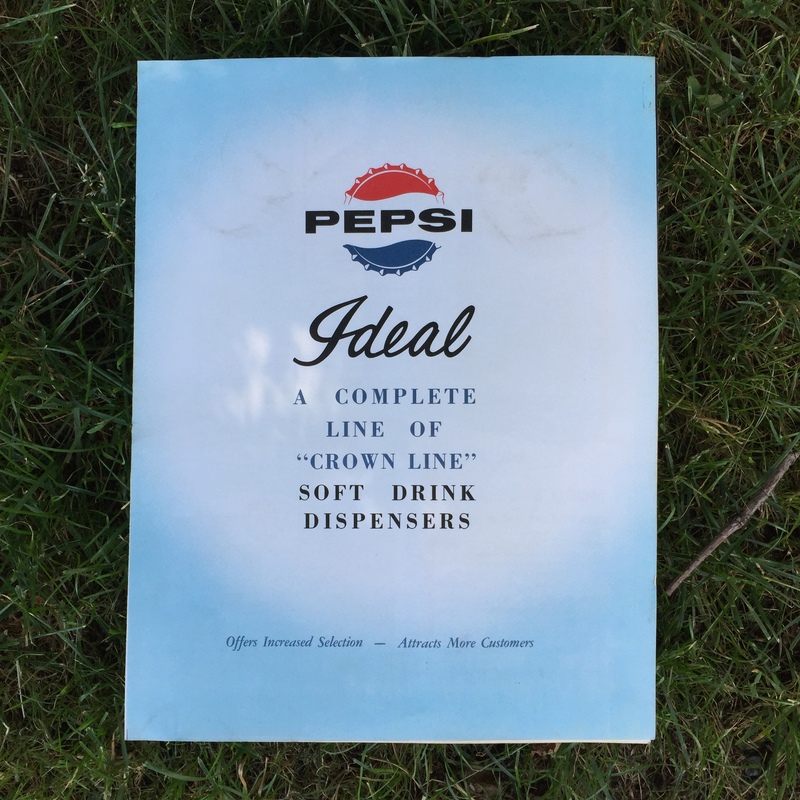 I also found some old store display signs, which I think were made in the 60s. 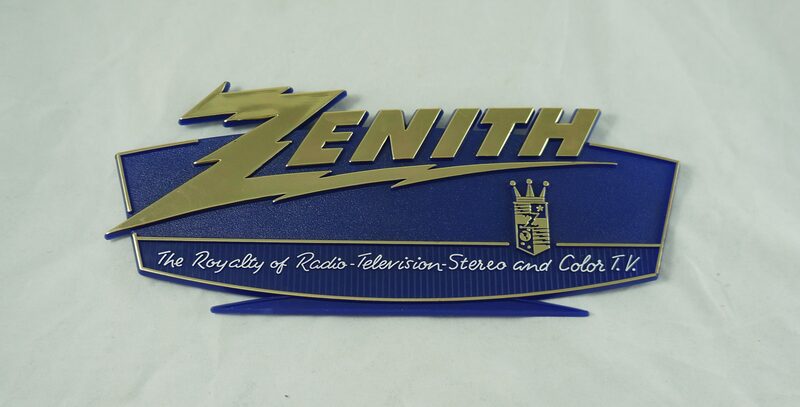 I have three of these Zenith signs, two of which are still in their original plastic. I listed the non-bagged one for 60$ and it has a fair number of “watchers” already. 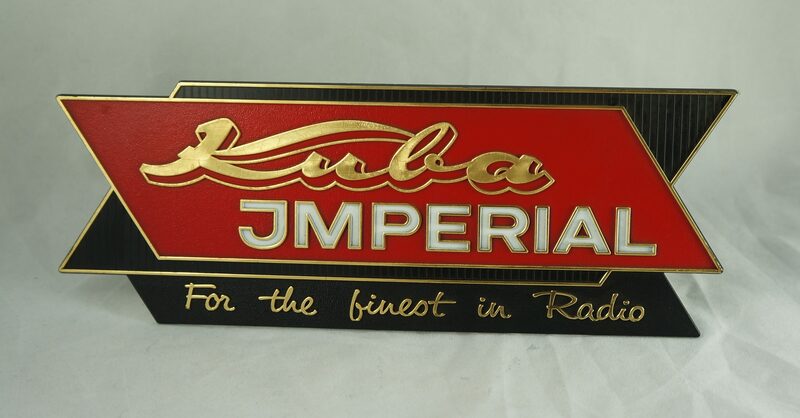 I also saved a similar sign for Kuba, a company known for their sometimes luxurious mid-century stereo consoles. This one sold pretty quickly for 50$. This spot is still producing, though the quality junk to actual junk ratio is pretty high on the wrong end. Westmount hasn’t been very productive for me lately, though this haul of vintage colognes was a pretty good find. I can’t remember which ones are worth eBaying (they’ve been in my basement since I found them) but I think the Dunhill Edition, Hermes, and Giorgio Beverly Hills VIP Edition are probably the most valuable. The ones I don’t list online will go to the auction house. I happened upon this beast while walking to my space on Coloniale. Fortunately it sat only a few minutes from home, the thing weighed at least 100 pounds and quite likely more. I had to carry it there myself – I took breaks every 30 seconds or so. 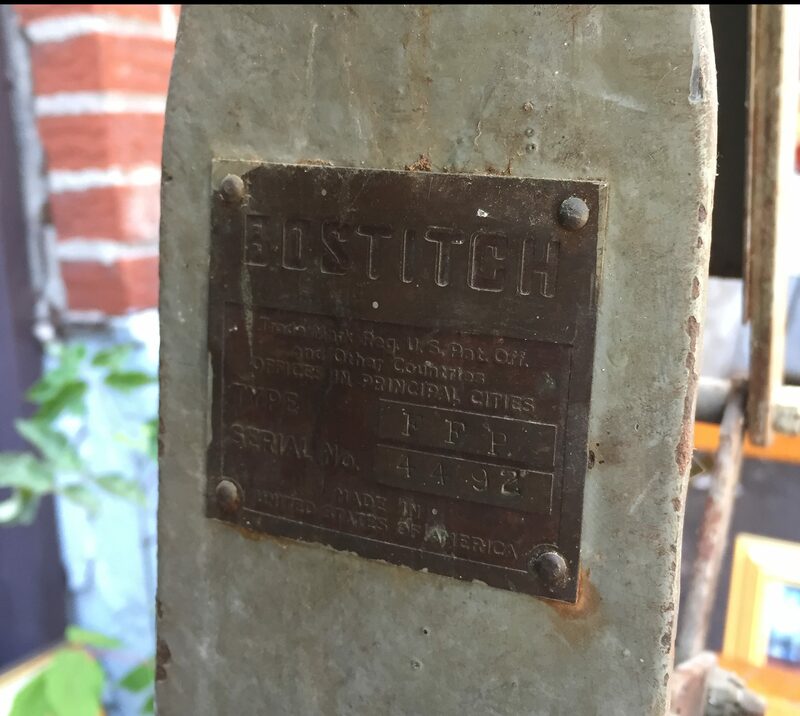 It’s an old industrial stapler made by Bostitch, I’m guessing in the 30s or 40s. I’m not sure who’ll buy it, but I lubed up the mechanism and brought it to the auction house. We’ll see how it does! Saint Michel has been pretty productive this summer. The first day I stopped at this section of the curb I saved a bunch of nice dishes (and a few other things, like a working fan). Those teacups were pretty cute, if not particularly valuable. The Fire King stuff is very nice, but it’s mostly loose pieces so not worth listing on eBay. My plan is to group all my mismatched Fire King, Pyrex, Glasbake, Federal Glass, and other similar pieces together for an auction lot. 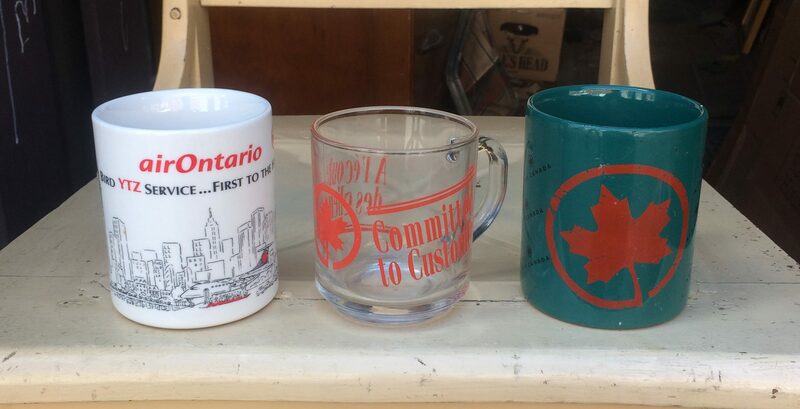 Those Pyrex mugs on the right are great. 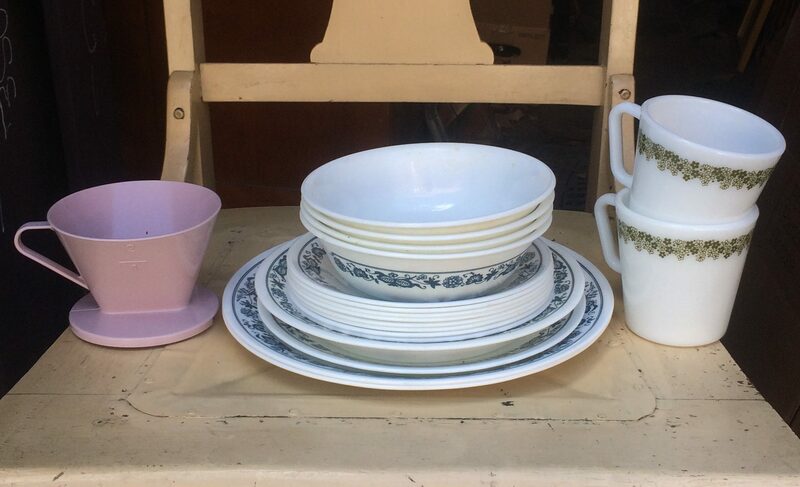 I sold the Corelle pieces at a yard sale for 3$, unfortunately there were a bunch missing from the set. This spot produced some great stuff a couple weeks later, but that’ll have to wait for a future post! I found these rings in an otherwise gross box elsewhere. The ones on top aren’t anything special but the three on the bottom are pretty cool. I took a more detailed picture which you can see below. I’m guessing the one on the left is made of some kind of antler. I think the other two are ivory, though I don’t know for sure. The one on the right has a “crown” that could be abalone or mother of pearl (it also looks like it used to have a stone). If you know more than I do please let us know in the comments! Last week this spot provided a deluxe version of Scrabble (with a rotating board and other accessories) and a few other wooden games. I’m hoping the finds keep coming, even if they’re few and far between. 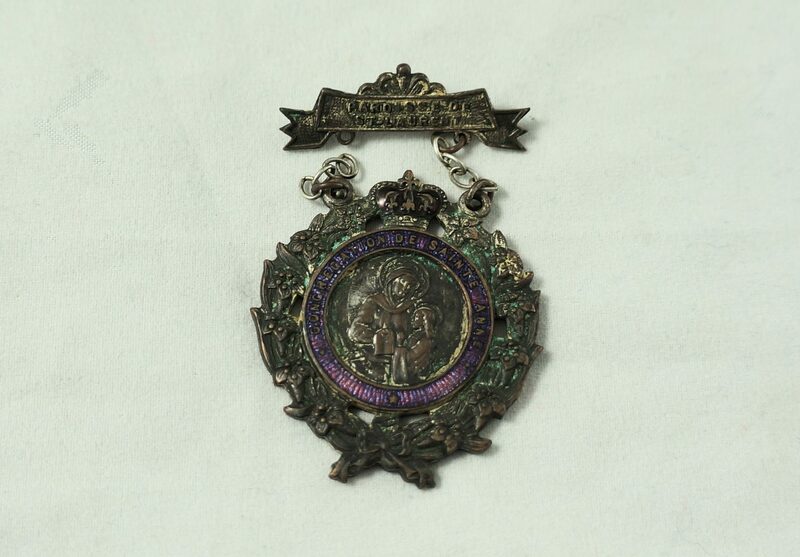 I found this religious medal in Ahuntsic a little while back and was curious about its origins. On top is written “Paroisse de St-Laurent” while “Congregation de Sainte-Anne” is seen in the purple enamel. I found a similar piece before but these don’t turn up very often, at least for me. Is it the kind of thing that might have belonged to a nun? If you know anything about it please let us know in the comments! Otherwise, a place not far from home tossed tonnes of great stuff last week. 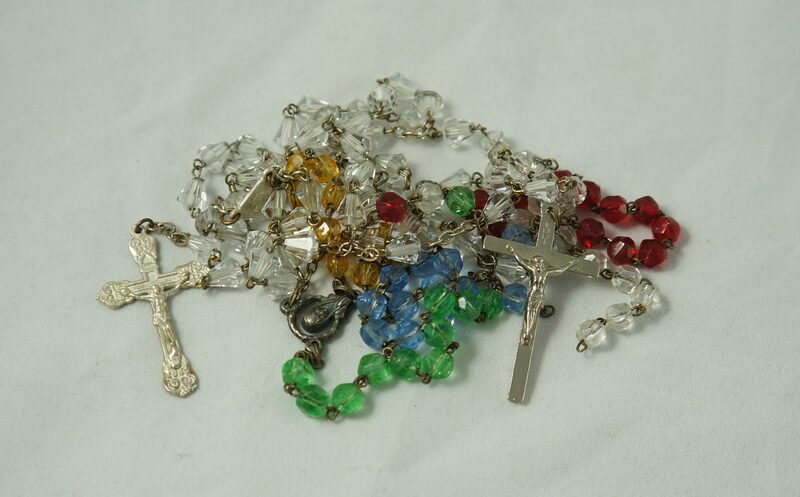 That’ll have to wait for another post, but for now here’s a couple of rosaries I found in the lead up to the big purge. The one with coloured beads is pretty cool, but the one with the clear beads has Italian silver hallmarks. It could be worth a bit of money. The next time I talk about this spot I’ll show you a pair of religious items that I haven’t seen in my travels previously. 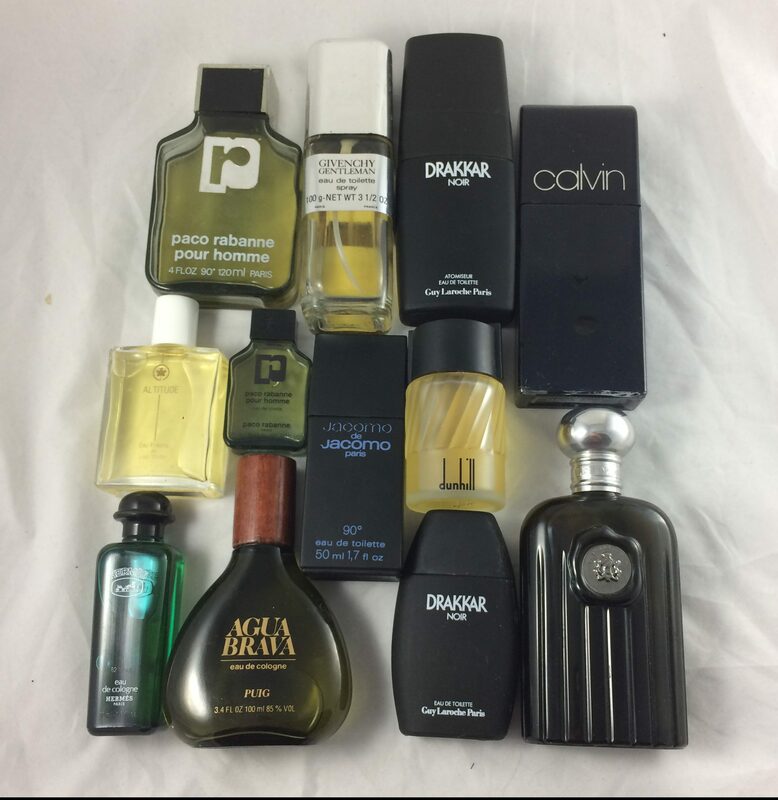 Vintage Givenchy Gentleman has a following among perfume aficionados. I would list it at a good price, depending on how much is in the bottle and if the condition is still good. I’ve sold a few small bottles of vintage Givenchy Gentleman for a good price (I think 50$ for a 30ml bottle). Unfortunately this bottle isn’t very full (maybe 20%) but it might still have some value. re those rings..i think the ones on top — the metal is actually silver? not sure if that is worth something. those others, before you go deciding they may be ivory, check what CURRENT laws/rules are on Ivory possession. I recently read a news article that some family took their antique (ivory keyed) piano with them to another country, and the country actually ripped the Ivory Keys off and destroyed them. I didn’t see any markings on them, and the molds were pretty poorly done so I doubt they are unmarked anything. Still cool yard sale stuff though. Yes Ivory laws can be complicated, making it difficult to sell (for good reason). Maybe I can find someone to help me identify them for sure, and then I can figure out what to do with them. – I learn a lot from reading your blog posts … I never knew of a non-returning boomerang either! 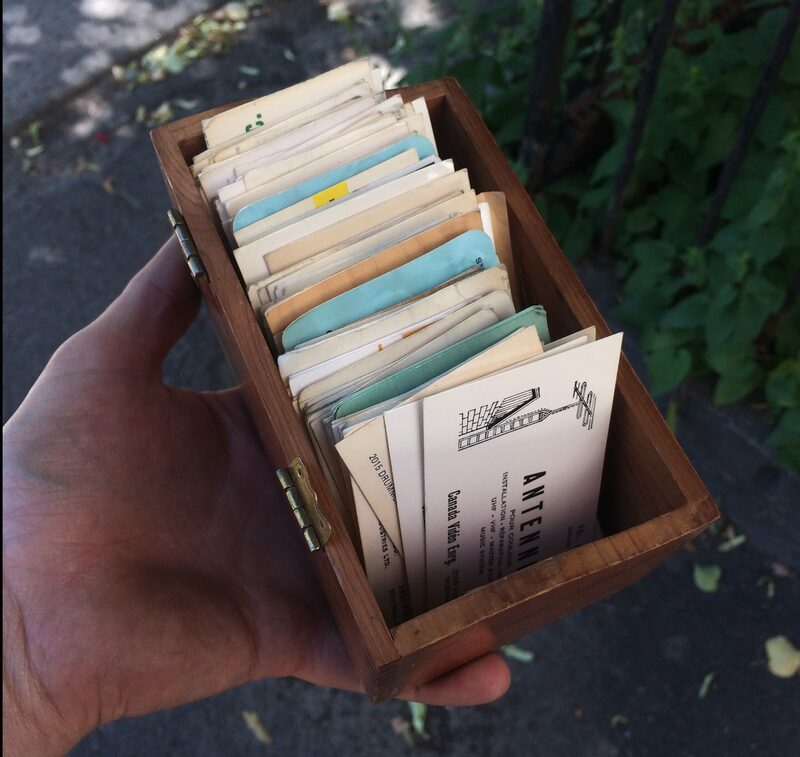 And I did not know you had a fascination for old business cards! 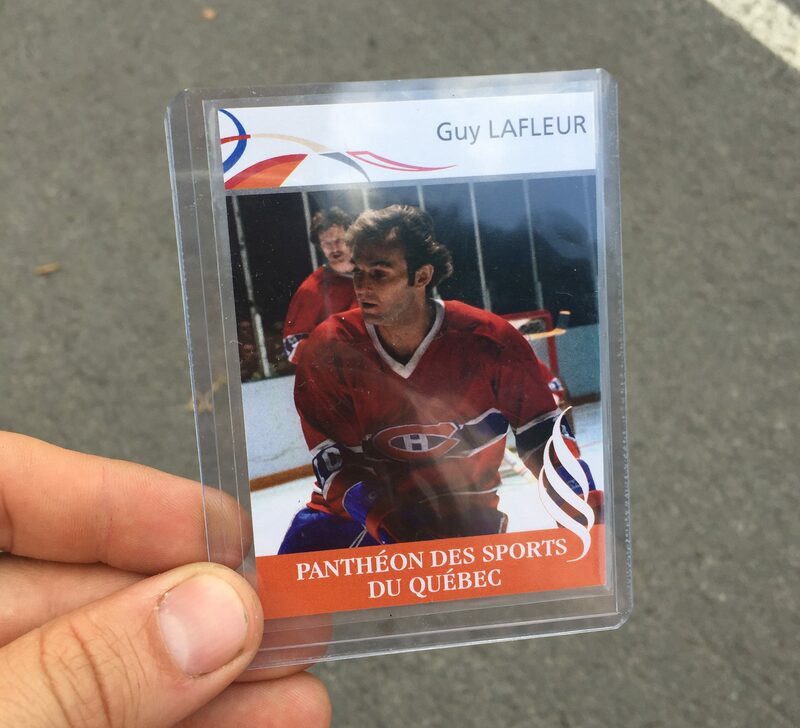 – I was a fan of Guy Lafleur back in the day (les deux Guy, actually) … inasmuch as I was a fan of anything hockey. Hahaha. Hope you get big bucks for his signature. – Just curious 1 … was that old industrial stapler a noisy thing once you got it lubed up? – Just curious 2 … were those rings with the large stones silver? – Next time you find Corelle plates and bowls, like the ones in the centre of your photo, set them aside for me, okay? I don’t care if they match. – I sure wish I lived closer. I’d be at your place(s) every day, helping out with the sorting and cleaning (gratis, of course). Yup, it seems that boomerangs appear in many different shapes and forms. I also learn a lot from writing the blog, lol. I like paper ephemera in general, and old business cards often have cool designs. (Plus, you never know if you’ll find the card of someone famous. I have Judge John Gomery’s business card, but he’s only famous if you followed Canadian politics in the 90s lol). The stapler wasn’t too noisy, it’s operated by a foot pedal so it’s not electric. It might be louder if there were actually staples in it though (not sure what kind that thing would take). I keep you in mind for Corelle, but only the pattern I know you have. I’ll try to remember that you want any kind. That is a really cool boomerang. What are you hoping to get for it? Honestly I’d be reasonably satisfied with 10$. Hopefully I get a bit more but I think it’d be a challenge to get 30$ on eBay, and shipping would be annoying (it’s fairly large). Some boomerangs go for a fair bit of money but usually they have a bit of a backstory / pedigree to them, which mine doesn’t really have (or at least I don’t know it). Maybe someone at the auction will see it, appreciate the quality, and pay good money for it. If not, there’s lots more garbage in the sea! For the record, it will probably end up in a lot with the other two pieces. Wonderful post and surprising finds! The no returning boomerang,is actually used for hunting,I saw the Australian Aboriginals use these to kill Kangaroos,in the 1960’s.The rings as someone mention could be Ivory..or bone.You would need a specialist auction for jewellery Some African bone jewelry of mine sold in auction for hundreds of dollars last year. . I always look forward to seeing what you find.best wishes. Cool, that’d be interesting to see. I actually found the rings in an area called little Maghreb (North African, largely Algerian here…) so maybe they have African roots. I hadn’t considered that previously. Grouping the teacups, Fire King items, etc together in one lot is a good idea. They match tonally and are very pretty together. If I lived locally I’d be interested in them. I think so too, it’d be attractive to collectors missing some key pieces as well as store owners who can sell complete sets for a lot of money. I think making quality lots is key for auction success! Such good reading! Enjoy every comment – yours and everyone else’s. To test for Ivory or bone, heat a straight pin really hot and poke it in a decreit place on the ring. If it goes in, it’s plastic. If not, it is ivory or bone, which doesn’t really answer the question entirely, but is a little more information than you started with. I’ve heard that the hot pin test isn’t great for a couple reasons. For one, it disfigures what might be a nice piece otherwise, and for two some of the plastics used can be combustible, so it can totally ruin the piece or cause a fire. Plus, like you say it wouldn’t even confirm one way or the other weather it was bone or ivory. It’s probably best to show the piece to someone in the know, they could probably figure it out in under five seconds. 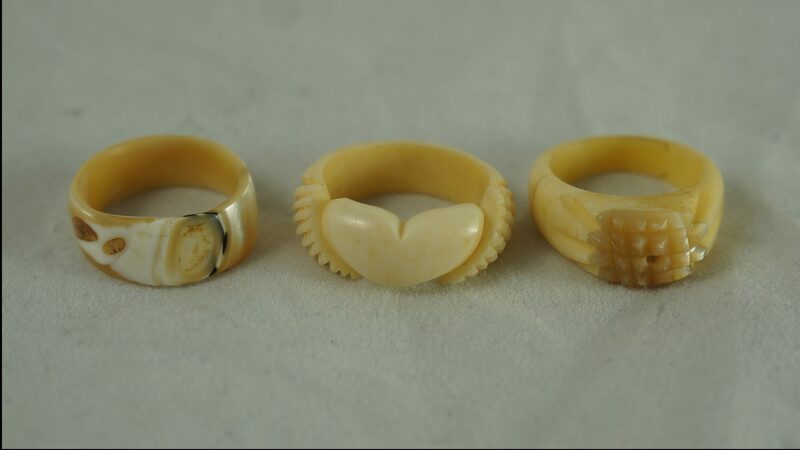 My first thought on your “ivory” rings was that the middle one in the bottom picture was a whale’s tail from Alaska. Possibly made from walrus tusk. Really enjoy your blog, Thank You. I asked my husband about the stapler. He said he used to use one like it while working at a manufacturing company years ago for stapling boxes. He said you probably can still get the staples through an industrial supply company like McMaster Carr. Hi Martin,you are a genius.You are not gaining many new followers and subscribers since recently,but your posts are great as usual.I was walking on Jules Verne street in Villeray near Parc Jarry and going to visit a friend.I found two very good tennis rackets and a Tiffany lamp shade in the trash.I took them.I also found a great antique teak side table on Guizot street three weeks ago.Please check out these streets whenever you can on trash day. Despite the fact you are inspiring many folks to check out the trash for treasures,many good things in the trash still do not get salvaged.I saw the truck pull up and swallow very nice ceramic pots last week.I was on the other side of the street and tried to run to salvage them,but the truck beat me to it.I felt very bad because the pots were what I could have used for my own plants.That regret burns me a week later. 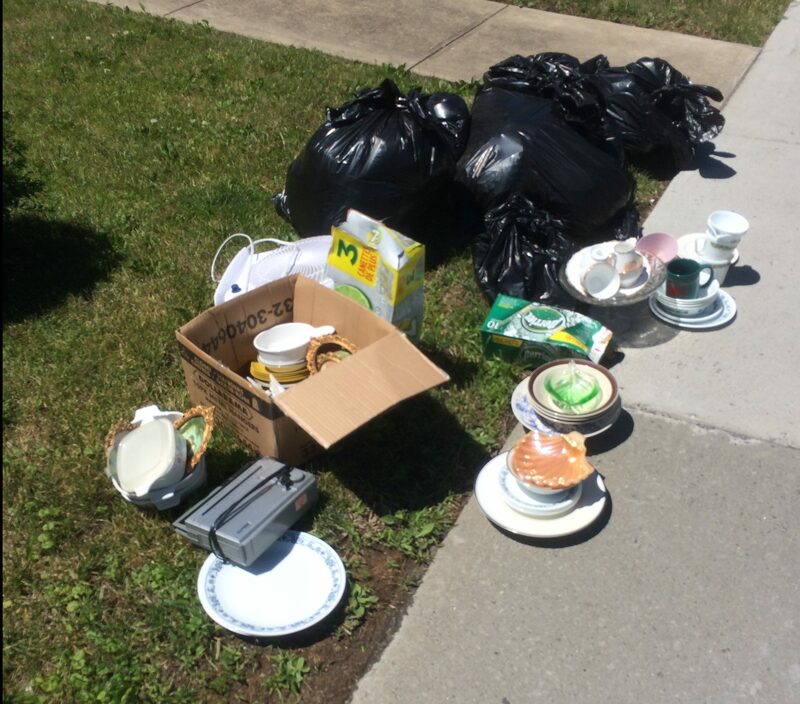 I know Ville Émard is a mostly working class neighborhood.But it has several quaint old homes and they throw out old treasures in the trash.Yesterday on Émard street late in the morning outside a home there were 15 or 20 boxes thrown out.Apparently rénovations were taking place there. Most of the stuff in the boxes did not seem interesting.But I rescued two POPULAR MECHANICS magazines from 1960.I also found two antique ashtrays there and took home a couple of vintage French books. Only old houses generally throw out vintage stuff and old magazines like that. Also last week in Ville Émard I found porcelain ducks,a porcelain rooster and several vases in the trash in Ville Émard.I was Lucky to be able to take them to my home. Ville Émard does produce treasures because many of its homes are from before 1960. 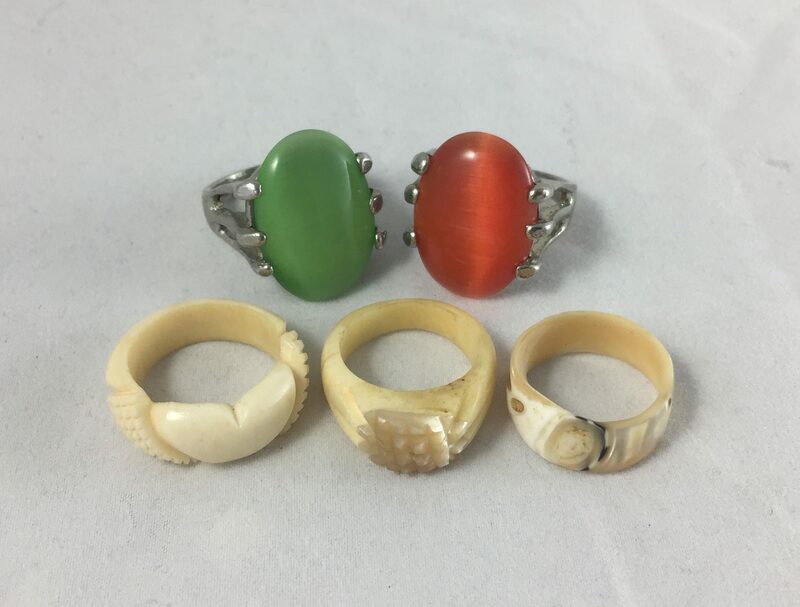 The trio of rings remind me of those sold in tourist shops of my youth. Most were seashell and I do remember some bone and antler ones as well. I am hungry for more posts.No new writings for a long while.Are you in summer hibernation? Mostly just retooling my business! I’ve been pretty busy for quite some time, so kind of the opposite of hibernation. First was the move to the smaller garage, around which time I discovered the auction place (and a lot of my stuff ended up there). Since then I’ve been adapting to the new auction approach by making lots of like items, clearing out the random stuff in my basement (much of which I would never have had time to deal with effectively anyways), and generally trying to organize things better (while also bringing in new garbage constantly, lol). I should have a new post up soon however.